Please allow us to suggest you some sightseeings and museums to make your stay in Tallinn a more pleasurable one. We hope you find our suggestions below useful, but in case you are looking for something extra, please visit this website about Tallinn treasures. A walk through Tallinn’s Old Town brings a heightened understanding of the rich history of the town, as well as a mysterious sense of the atmosphere of the old days: many of the houses in Tallinn Old Town are claimed to be haunted even these days and on the Town Hall Square you can still see the stones marking the location of the guillotine and torture posts. If you wish to see the sights outside the Old Town, the most comfortable way for that is using the City Tour hop on, hop off buses that depart about 200m from theMy City Hotel in Tallinn Old Town. You can choose between three different routes. If you stay in My City Hotel in Tallinn, you find yourself in the heart of one sight. Tallinn’s medieval Old Town is included in the UNESCO World Heritage list. Its oldest walls, towers and churches date back to the 13th century. Its winding, cobbled streets lead to merchants’ houses, courtyards and handicraft stalls. The Old Town has two parts – Toompea Hill, once home to the noble families who ruled the country, and Lower Town. There are viewing platforms in the Old Town, where you can enjoy the scenic view over the city and these are also perfect for watching the sunset. The Kadriorg Art Museum introduces, preserves and collects early foreign art – primarily western European and Russian paintings, graphic arts, sculpture and applied arts. The Kadriorg Art Museum is the only museum in Estonia devoted to foreign art. Estonia’s largest collection of western European and Russian art (about 9,000 works of art from the 16th to 20th centuries) is located here. The museum is located in Kadriorg Park in Tallinn, in a Baroque palace built by Tsar Peter the Great of Russia as a summer residence. Located in Tallinn, on the seashore of Rocca al Mare. It is akin to a village, where you can see Estonian rural architecture and village life from the 18th to the 20th centuries. It is not only a historic display of medieval life, but you can experience it yourself – ride in a carriage, get acquainted with domestic animals and enjoy a picnic in the fresh air. Like in any village, there is a church, a tavern, a school, some mills, a fire station, etc. The Kumu Art Museum in Tallinn houses the national art collection and is a must-see for visitors interested in learning about Estonian culture. The spectacular building opened in 2006, offering a vibrant showcase for a range of excellent exhibitions. Located on the edge of th picturesque Kadriorg Park, the Kumu Art museum is one of Tallinn’s highlights. The view and sightseeing from Tallinn TV Tower is unique in Estonia as well as in all of Northern Europe. Under your feet are the captivating Tallinn Old Town and the glistening Baltic Sea in all of its majestic glory are off in the distance. When Estonia was still behind the Iron Curtain, this was for many Estonians a window on the free world – at night one could even catch sight of the lights of Helsinki. To illustrate the view, visitors can use multimedia screens: to increase the area visible in it or seeing what the place looked like in the past. It is a view that must be seen. And – experienced! The Museum of Occupations provides a comprehensive overview of Estonian society during three periods of occupation: the first Soviet occupation 1940–1941, the German occupation 1941–1944, and the second Soviet occupation 1944–1991. Audio-visual displays and photos highlight the events of the era, repression and national resistance, as well as showing how people coped with the day-to-day realities of this difficult period. The unforgettable Seaplane Harbour is home to a super-modern maritime and military museum, complete with historic ships to tour. 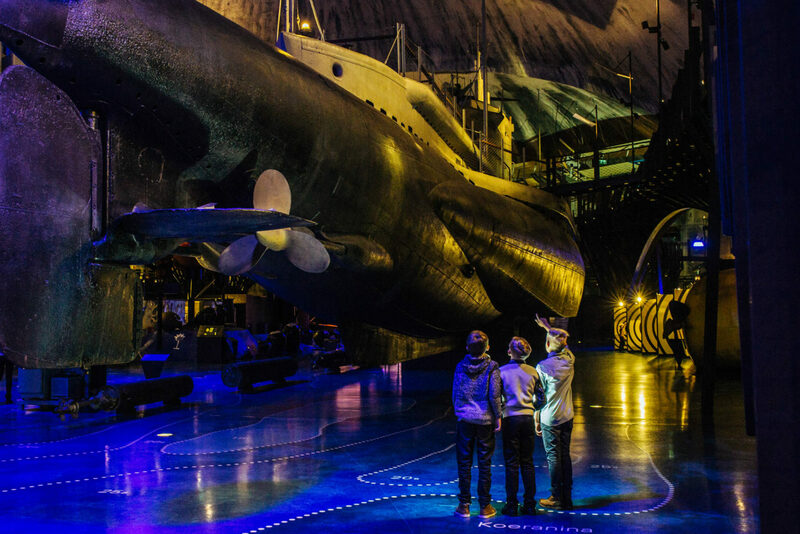 It is a memorable experience for the whole family: lots of interesting reading, a voyage around the world in the Yellow Submarine, photos taken in naval uniforms, the big aquarium, the simulators, paper plane precision throwing and many more exciting activities.